Our first game of the evening saw a match up of last seasons top two sides as Fitzroy took on Moreland. With Moreland understrength Fitzroy took full advantage adding six first half goals to one with Sarah Richardson & Stacey Papadopoulos both bagging braces to guide their side to a half time lead. Fitzroy did not stop applying the pressure in the second half as they banged in another eight goals with Em Coppock getting four second half goals, and Richardson & Papadopoulos bringing up their hat tricks in a totally dominant display from the Champions who go into Series Futsal Australia full of confidence while Moreland need to re-group before next weeks national competition. Next up we saw Westside come up against Pascoe Vale who were looking for their first three points of the season. After a cagey opening it was Pascoe who got the opening goal with Marcela Marques finding the net to give her side the lead. It should have been two shortly after as Liesl Woods blew a golden opportunity to double the advantage, meaning they would lead by one at the half time break. Early in the second half Westside would draw level with Padiki Dade finding the net to restore parody but the lead did not last long with Liesl Woods toe poking home after a great ball from Marques. Abbey Flight then finished on the move as Pascoe Vale had opened up a two goal cushion and were in line for an upset win. Pam Demetriou would pull one back for Westisde as they chased an equaliser, and managed to find one as Lisa Fonua lashed home a loose ball to level the game and send it to penalties. It seemed nobody would miss during the shootout, until Elly Torre for Westside saw her effort saved after the tenth penalty to help Pascoe Vale complete their upset win. The final game of the evening saw Northcote looking to bounce back from a heavy round one defeat, take on Carlton who were looking to take maximum points from their two games. It took a little while for the Heart to break through but the deadlock was broken thanks to a cracking effort from Nicole Ritchie from around ten meters as she opened the scoring. A mistake soon after gave Rebecca Davies too much time and space as she lashed home the Hearts second to go into the break leading 2-0. After the half time break there was no slowing down as Carlton added their third of the game following a lovely counter attack which saw Jess Byrne tap home, and the floodgates were beginning to open as Katie Foster was left one on one before she tucked away another. Youngster and first gamer Pyper Cohen got a debut goal for the Heart as it all looked a little too easy, with Foster getting a second to make it six. Carlton were looking too strong as Davies added her second, before turning provider for Malka Suratie to get her first of the night. Davies then set up Byrne to tap home her second giving Carlton an 9-0 lead. 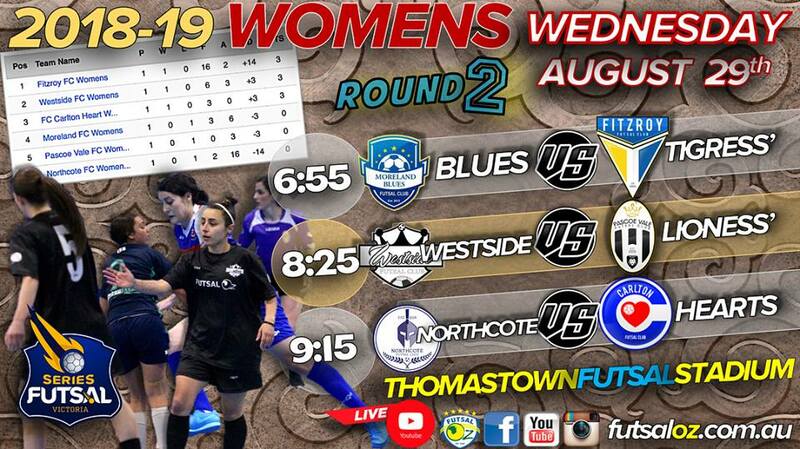 Theresa Borges pulled a goal back for Northcote, before Thomay Nicolaou netted to have a mini revival on the cards. Carlton sealed the deal as Ritchie got her second of the game and gave Carlton their second win from as many games.